Note that our new ELECTRONIC WAREHOUSE MANAGER, running on inexpensive Android tablets is the now the preferred choice to streamline your warehouse operations. Please click here to learn more about this new and innovative solution. 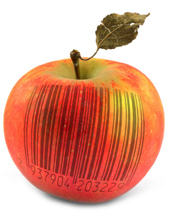 NECS designed our entrée.UPC software to bring the power of barcodes to your foodservice operation. The cost savings that entrée.UPC will bring you in the form of a reduced warehouse and office staff, speed and accuracy, will pay for itself in a very short time. NECS customers who have upgraded their warehouse operations to barcode scanning, would never think of running their warehouse any other way. It operates with WIFI based, wireless handheld computers running Windows Mobile 5 or later. • Will scan any barcode label and works with non-barcoded product. It will even print barcode labels for you. • Orders are picked and on the way to the customer with accurate invoices in a fraction of the time it takes you now. • Serve your customers faster through improved productivity in the warehouse and front office. • Eliminate order picking errors, including over/under ships, wrong item ships, etc. • Improve employee morale with a user friendly tool that helps them do their job easier and faster. • Improve your reputation for reliability by having accurate orders that go out correctly the first time. • Reduces customer order shortage claims. • Reduces customer “special runs” to correct critical order errors. • Reduces excessive employee overtime and even warehouse staff. • Catch weights are scanned, making it unnecessary for office to manually enter. • Makes theft visible and risky. To view specific features that this product offers, please click here. Error retrieving news from the database!